Remodeling your kitchen is a big job but one that can add a lot to your home and your everyday life. Kitchens are truly the heart of the home and with how much time is spent there you probably want it to be perfect for your family. With a little planning and help from the pros you can have the kitchen you’ve always wanted. Here are some tips to keep you focused. It might be tempting to try and cut costs by doing your own remodeling, but this is often a big and costly mistake. Well-trained professionals know what they’re doing and should be able to apply their skills to give you what you want. Do you really need, and would you use, a wine fridge? How about that fad finish on the cabinets that might look out of date in a few years? While those additions are probably unnecessary, extra leg room in a breakfast nook, or an extra cabinet for the heirloom fine china, might not be. It’s your dream kitchen, so dream big, but make sure your dreams make sense. 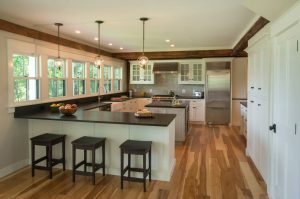 All the extra bells and whistles you may be tempted to add during your custom kitchen remodeling may or may not be a detriment over time. Kitchens should always be designed with a “work triangle” in mind. This triangle exists between the fridge, sink, and stove, and the distance between each of these should be between 4 and 9 feet to make cooking and other kitchen activities easier. Make sure your lofty kitchen aspirations still adhere to this very helpful design tip. Discussing all the elements that you want in your new kitchen can be a lot of fun, and there is no reason not to go a little bit crazy with the brainstorming. Just make sure you bring it back down to something realistic when you consult with your custom kitchen remodeling contractor.